Siblings can shape our character, share so many experiences with us and may know us better than anyone. Healthy sibling relationships are associated with lower levels of depression and more satisfaction with life. It’s a unique bond, for many of us the longest relationship we’ll have. Our siblings are usually there as we face those defining moments, from our first day of school to the deaths of our parents and finally through our own old age, illness and death. But what happens when those ‘final’ life moments come prematurely? Since my undergraduate degree, I have volunteered at Great Ormond Street Hospital. As part of my role at the hospital, I provide therapeutic recreation such as games, crafts and general chit chat to the children and young people on the wards, to help build a sense of normality and create some positive memories during a very difficult time. The patients are sometimes on their own, and sometimes with their families. Beyond the beeping from the machines, the medical surroundings and the seriousness of the situation, it occasionally feels like I’ve entered a family’s living room on a rainy Sunday afternoon. I’m part of their family. In spite of medical advances, substantial emotional challenges come with serious illnesses – carefree childhood innocence can be swept away, replaced by relentless treatments. Patients with chronic and serious illnesses are particularly vulnerable to developing mental health issues. Serious illness can present many additional challenges to the whole family, such as disruption to routines and profound levels of uncertainty. Christine Eiser has noted that a diagnosis of a childhood serious illness places ordinary families in extraordinary circumstances. Being whisked out of the family home into a foreign environment with your child’s care in the hands of strangers, whilst masking most of your own pain, is something no parent should have to experience. As one Dad once told me, ‘If I had the option for the cancer to be in me instead of my little boy, I wouldn’t have to think twice’. Each room I visit at the hospital, I put everything I can into bringing some light to the patients and respite to the parents. However, for some time I failed to acknowledge how difficult the situation must be for the other children who were also being thrust into the confusing world of serious illness – the siblings. One particularly memorable day on the oncology ward shifted my perspective. I knocked on the door to a family of five: Mum, Dad and three brothers. The middle brother (aged eight) was the patient and greeted me eagerly with his younger brother, keen to take a peek at the games I had with me. I ended up playing ‘Buckaroo’ with them and after a couple of games, the Dad joyfully joined in too. Meanwhile, the Mum went to grab some lunch and the older brother sat slumped in a chair, complaining to his Dad that the Wi-Fi wouldn’t connect. He seemed irritable. ‘Typical teenager’, I imagined my own parents commenting, and then continued playing. A nurse entered to do a couple of quick checks – a straightforward blood pressure and temperature check, nothing too invasive. I happened to glance back up at the older brother. His previously disgruntled and bored expression had been replaced by one of pain, with a look of sheer love and hurt in his eyes. Pure human emotion which couldn’t be concealed. An instinct to protect his little brother from harm, whilst being completely powerless. In the next room I visited, the patient was completely distant, pale and seemingly too ill to engage. His bouncy little sister (aged five) chatted away to me about how much she loved doing art at school… she needed a red pen to finish her project. Feeling unsure if it was my place to be in the room with the patient being so unwell, I found a nurse on the ward who reassured me that it was really positive for the family to be doing things like this together. She said the boy was unlikely to make it to the end of the week, so it was important for him to be around his sister. I went back into the room with the all-important red pen, looking back at the sister. It struck me that she probably had no idea what was about to happen. Soon enough, she would leave the hospital for the final time with her grieving parents and would have to grow up as an only child. Only the patient was in the final room I visited that day, but I caught myself glancing up at the photos on her wall – four healthy children laughing together under a glittery banner which read ‘my three brothers’. On my commute home that evening, my thoughts kept going back to the siblings. With their parents often away from home with the patient, ‘normal’ family life probably ceases to exist for these children. It would be no surprise if all of this had a tremendous toll on siblings, yet what support are they receiving? My interest in siblings led me to study the psychological adjustment of healthy siblings to a paediatric cancer patient, as my dissertation topic during my final year as a psychology undergraduate student. Findings from recent research in this field highlighted that siblings of children with cancer do experience a range of emotions, including stress, guilt, hopelessness, embarrassment, anger, loss and anticipatory grief. Further, siblings commonly experience symptoms of distress which fall into the clinical range of psychiatric disorders including anxiety, depression and PTSD. It has been estimated that approximately 5 per cent of adolescents have met criteria of PTSD at some point in their lifetime (Hamblen & Barnett, 2016) – significantly lower than the 22 per cent reported in siblings of cancer patients by Kaplan et al. (2013). Interestingly, in a longitudinal study led by Bregje Houtzager, compared to peers, this poor psychological adjustment is elevated from the first few weeks after diagnosis and remains significantly higher at follow-up six months later. Further, siblings of childhood cancer survivors report higher levels of poor psychological adjustment later in life, including increased symptoms of depression and post-traumatic stress, as well as increased hospital contact for mental health disorders compared to individuals without the experience of having a sibling with cancer, highlighting the prolonged impacts on siblings. Collectively, this research suggests that siblings of children with cancer are particularly vulnerable to experiencing emotional difficulties and mental health problems. However, the intensive focus remains on the patient (both clinically and academically) and beyond this on the parents. Are the needs of siblings being overlooked? A recent review by Christian Knecht and colleagues suggested that sibling distress often goes unnoticed by both parents and oncology care teams. That is, in research where measures of sibling psychological adjustment have been completed by a combination of siblings, parents and clinicians, findings have suggested that sibling reports of psychological adjustment are not congruent with the reports of others, with poor psychological adjustment often only being reported by the siblings. Reasons for this might include an understandable focus of parental attention on the patients, as well as siblings feeling their issues aren’t important enough to burden their already worried parents. Thus, siblings may adapt their behaviour to fit the needs of the family, often internalising their distress. As of result, siblings have been labelled as the ‘forgotten child’ in the context of paediatric cancer. Indeed, whilst discussing my dissertation topic with people in my personal life (family, friends, colleagues), I was often met with responses similar to ‘It’s always the parents I feel for’ and ‘Oh, I’ve never really thought about the siblings’. But don’t siblings matter too? While we may not be able to remove the main source of distress for siblings, we need to consider the factors associated with their psychological adjustment. In reviewing recent literature, three factors in particular have consistently been reported to be associated with the psychological adjustment of siblings of paediatric cancer patients: knowledge about the cancer, coping strategies and social support. In terms of knowledge, research suggests that keeping kids in the dark about their sibling’s cancer has the potential to do more harm than good. When siblings are shielded from knowing about the cancer, they may return this silence and not express their own distress. Qualitative research, such as a study conducted by Juyoun Yu and Kyung-Sook Bang, has reported that most siblings express a desire to know more about the illness, to help them to feel less confused and uncertain, as well as more in control of the situation. Beyond the perceived benefits, a recent review quantitative research written by Incledon and colleagues concluded that siblings who have a greater understanding reported lower levels of poor psychological adjustment (including symptoms of anxiety and depression). Theoretical frameworks from developmental psychology can be used to help better understand how lack of knowledge can result in psychological distress across ages. Jean Piaget explained that preschool and young school children view the world as if they are its centre – they believe events are due to them, and thus experience feelings of guilt or fear that they will be able to ‘catch’ the illness. In contrast, older children and adolescents tend to have the ability to think in a more flexible way and hypothesise potential outcomes. Further, adolescents have a greater awareness of their own mortality, thus increasing existential fears, concerns of the worst-case scenario and a sense of hopelessness. This age group is also more likely to engage in egotistic thinking, resulting in ‘why-me’ reactions and feelings of loneliness and isolation. Thus, communicating age-appropriate information with siblings is fundamental – younger siblings need reassurance it is not their fault, older siblings might need to reframe negative beliefs. Involving siblings in the care of the child (i.e. introducing to healthcare team, decorating the patient’s room), and exploring feelings through creative activities such as ‘hospital roleplay’, ‘worry boxes’ and reading related books can be helpful ways of helping siblings to feel both connected and informed. Communicating with siblings can also provide an opportunity to build on healthy coping strategies. Recent research, such as a study led by Rachel Hamama, has reported that higher levels of self-control and predictive control – in terms of having positive expectations and remaining optimistic – are predictive of better psychological adjustment in siblings. Conversely, in a qualitative study conducted by Eli Gardner where siblings were interviewed about their coping strategies and psychological adjustment, it was reported that catastrophic thinking and denial may increase the stress experienced by siblings. This highlights the importance of identifying maladaptive coping strategies (e.g. catastrophic thinking) and facilitating the development of adaptive coping strategies (e.g. self-control, predictive control) when communicating with siblings. As is the case when dealing with most adverse circumstances, having a strong social support network has been found to be particularly valuable in supporting siblings of paediatric cancer patients. As families tend to form the central system of support for children and adolescents, parental support is particularly vital. Thus, it is important for siblings to still feel as though their emotions are recognised and their voice is valued within the family. Peer support has also been found to be associated with sibling psychological adjustment. Typically defined as support provided by people who have lived experiences, peer support provides a unique opportunity to facilitate a sense of mutual understanding, through relating to others in a similar situation, thus reducing isolation. This support may be especially important for older children and adolescents due to the tendency to feel alone in their experiences, as well as the tendency to be heavily influenced by the thoughts and behaviours of their peers. Research has reported significant relationships between higher overall levels of knowledge about the cancer, adaptive coping strategies and social support, and better psychological adjustment of sibling (Patterson et al., 2011). Guided by these factors, interventions for promoting psychological adjustment in siblings of children with serious illnesses have been developed. These interventions usually consist of several sessions in varied formats: individual, group and online. Individual interventions involve clinicians working on a one-to-one basis with siblings. Such interventions can be broadly categorised into educational interventions which focus on improving the child’s knowledge of their sibling’s illness and psychological interventions which focus on developing more adaptive coping strategies. Alternatively, group interventions look to bolster social support. In family interventions, both the siblings and parents are typically involved. Parents participate in activities which parallel the content of the sibling sessions and are aimed at improving awareness of the impacts of having an ill sibling. Importantly, parents and siblings typically engage in group activities and discussions to help develop a mutual understanding of one another’s distress. When the patient is well enough, family interventions (such as residential camps for families affected by serious illnesses) can also allow siblings to experience a sense of normality and bond with their family, with the security of medical support nearby. Peer support interventions, such as group meetings and residential camps for siblings, provide a space for siblings to naturally connect with others who have shared experiences. Socialising with others in similar situations can help with attitudinal barriers – feelings of embarrassment have been consistently reported as a major stressor amongst siblings. More recently, internet-based therapeutic interventions for siblings have been developed, to help to overcome the barriers of accessing face-to-face intervention, such as travel and time constraints. Novel delivery methods, such as audio conferencing in a study led by Sheryl Gettings and emails within a study led by Margaretha Nolbris, have been piloted with positive effects. Research which compared pre- and post-interventions measures of distress (e.g. symptoms of anxiety and depression, levels of loneliness) has suggested that these are promising methods of promoting psychological adjustment. We should also note that having a sibling with a serious illness can result in some positive changes, such as increases in empathy, maturity, advocacy and appreciation of what matters. We need to support siblings, to help facilitate post-traumatic growth and draw positives from difficult circumstances. A family-centred collaborative approach is required, with families, clinicians and academic researchers ensuring a standard of care in future practice. Such policies should include routine screening of each sibling (including measures psychological adjustment and the associated factors). Impacts on siblings could be integrated into training for staff, encouraging open communication with siblings. Schools will also play an important role. 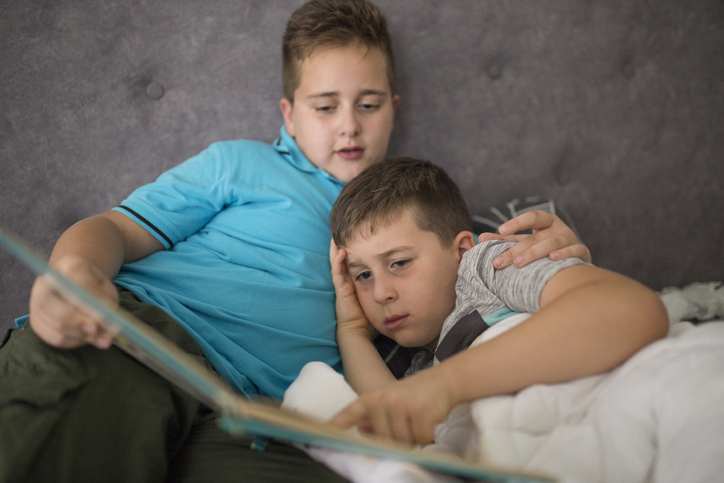 Siblings of ill children don’t usually have the option of ‘compassionate leave’ or taking ‘a break’… they are expected to continue at school and keep up with their classmates. They may well struggle to concentrate, and become withdrawn, putting them at an increased risk of being bullied about their situation. An assigned member of staff could build a trusting relationship with the sibling, so they can discuss any concerns. As ever, there are financial and logistical considerations here. There are, however, things we can all do to make a positive difference to siblings. Reach out, open up a space for talk. Show a genuine interest. Make them feel valued, and aware that their identity isn’t defined by their sibling’s illness. Look out for any changes in them, signs of distress. Answer questions directly, in honest words which can be understood. Where possible, help to facilitate a routine in the sibling’s life – help to create some feelings of normality. Advocate: help to make sure the sibling is being acknowledged, respected and listened to. And signpost: siblings may not know that support is out there for them, so look up what is available in their area and guide them towards accessing appropriate support. This might include the Rainbow Trust (support for families with a seriously ill child), ‘Sibs’ (for siblings of disabled children and adults), and ‘Over The Wall’ (provide life-changing activity camps for families affected by serious health challenges). Together, we can make a greater effort to protect and catch these children before they fall. They deserve much more than just a passing thought. It is time for siblings to have their own spotlight. Eiser, C. (1997). Effects of chronic illness on children and their families. Advances in Psychiatric Treatment, 3, 204-210. Gardner, E. (1998). Siblings of chronically ill children: Towards an understanding process. Clinical Child Psychology and Psychiatry, 3(2), 213-227. Gettings, S., Franco, F., & Santosh, P. J. (2015). Facilitating support groups for siblings of children with neurodevelopmental disorders using audio-conferencing: a longitudinal feasibility study. Child and Adolescent Psychiatry and Mental Health, 9(1), 8. Hamama, R., Ronen, T., & Feigin, R. (2003). Self-control, anxiety, and loneliness in siblings of children with cancer. Social Work in Health Care, 31(1), 63-83. Houtzager, B. A., Grootenhuis, M. A., Hoekstra-Weebers, J. E., Caron, H. N., & Last, B. F. (2003). Psychosocial functioning in siblings of paediatric cancer patients one to six months after diagnosis. European Journal of Cancer, 39(10), 1423-1432. Incledon, E., Williams, L., Hazell, T., Heard, T. R., Flowers, A., & Hiscock, H. (2015). A review of factors associated with mental health in siblings of children with chronic illness. Journal of Child Health Care, 19(2), 181-194. Kaplan, L. M., Kaal, K. J., Bradley, L., & Alderfer, M. A. (2013). Cancer-related traumatic stress reactions in siblings of children with cancer. Families, Systems and Health, 31(2), 2015-217. Knecht, C, Hellmers, C, & Metzing, S (2015). The perspective of siblings of children with chronic illness: A literature review. Journal of Pediatric Nursing, 30(1), 102–116. Nolbris, M. J., & Ahlstrom, B. H. (2014). Siblings of children with cancer - their experiences of participating in a person-centered support intervention combining education, learning and reflection: Pre- and post-intervention interviews. European Journal of Oncology Nursing, 18(3), 254-260. Patterson, P., Millar, B., & Visser. A. (2011). The development of an instrument to assess the unmet needs of young people who have a sibling with cancer: Piloting the sibling cancer needs instrument (SCNI). Journal of Pediatric Oncology Nursing, 28(1), 16-26. Yu, J., & Bang, K. S. (2015). Perceived alienation of, and social support for, siblings with cancer. Journal of Pediatric Oncology Nursing, 32(6), 410-416.